The Global Volcanism Program has no activity reports for Graciosa. The Global Volcanism Program has no Weekly Reports available for Graciosa. The Global Volcanism Program has no Bulletin Reports available for Graciosa. The SE end of Graciosa, the northernmost of the central Azorean islands, contains a small 0.9 x 1.6 km caldera with active fumaroles. The 402-m-high SE caldera rim is the high point of the small 4 x 8 km island. The caldera has been the source of eruptions producing significant tephra falls, pyroclastic flows, lahars, and lava flows. An important fumarole field is located in a volcanic cave inside the caldera, and a submarine fumarole occurs off the NW coast. Scoria cones erupted along several widely spaced NE-SW-trending fissures fed a youthful lava field that forms the NW end of the island. The most recent eruption from Pico Tomao, NW of the caldera, produced a lava flow during the mid-to-late Holocene that reached the eastern coast NW of the village of Praia. Zbyszewski G, Candido de Medeiros A, Veiga Ferreira O da, Torre de Assuncao C, 1972. Geologic map of Ihla Graciosa (Azores). Servicos Geologicos Portugal, 1:25,000 scale map with 31 p text (in Portuguese). There is no Deformation History data available for Graciosa. There is no Emissions History data available for Graciosa. 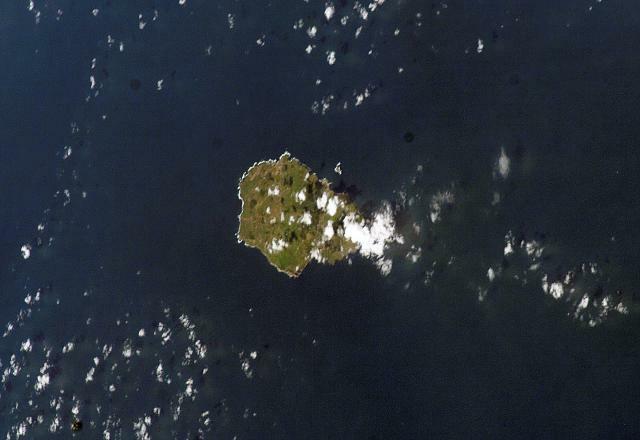 The small 4 x 8 km island of Graciosa is seen in this NASA Space Shuttle image with north to the upper left. Cloud banks partially obscure the SE end of the island, which contains a small 0.9 x 1.6 km caldera with active fumaroles. Scoria cones are found over much of the island, and several widely spaced NE-SW-trending fissures fed a youthful lava field that forms the NW end of the island. NASA Space Shuttle image ISS004-E-10893, 2002 (http://eol.jsc.nasa.gov/). 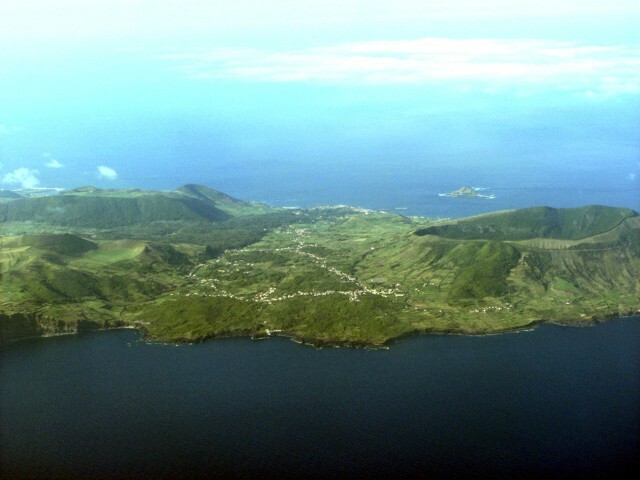 The Caldeira area of Graciosa is seen in this aerial view from the SW with the village of Luz at the center of the image. The small, 0.9 x 1.6 km caldera at the SE end of the island contains active fumaroles. The 402-m-high SE caldera rim is the high point of the small 4 x 8 km island. The most recent eruption from Pico Tomao, NW of the caldera, produced a lava flow that reached the eastern coast NW of the village of Praia. Photo by Angrense, 2007 (Wikimedia Commons). The Global Volcanism Program has no maps available for Graciosa. There are no samples for Graciosa in the Smithsonian's NMNH Department of Mineral Sciences Rock and Ore collection. IRIS seismic stations/networks Incorporated Research Institutions for Seismology (IRIS) Data Services map showing the location of seismic stations from all available networks (permanent or temporary) within a radius of 0.18° (about 20 km at mid-latitudes) from the given location of Graciosa. Users can customize a variety of filters and options in the left panel. Note that if there are no stations are known the map will default to show the entire world with a "No data matched request" error notice. Large Eruptions of Graciosa Information about large Quaternary eruptions (VEI >= 4) is cataloged in the Large Magnitude Explosive Volcanic Eruptions (LaMEVE) database of the Volcano Global Risk Identification and Analysis Project (VOGRIPA).